British Colombia is famous for its amazing landscapes, mountains and wildlife. Personally, I’m a hiker. Not a professional one but I’m practicing as much as I can in France. I don’t really know how to explain the feeling that i have when I’m on top of a mountain. You have this whole picture in front of you, you are speechless and glad of your effort because of the beauty you see. I didn’t come to the Ranch to do mountain hiking, but I always kept this idea in my mind. While I evolved in my professional field as a cook, I also practiced some hiking around during my days off. The more I practiced it, the more I felt confident about the trail and I was able to bring other groups of people to all of these amazing views. During my stay I had seen many guides coming back from their trips and sharing their stories. I also had a look at all of the pictures that they left on the computer and I really knew that i wanted to live this experience ! I knew that it would be a lot of work and not an easy trip but my motivation pushed me to be prepared and ready for all of the adventures! As soon as I saw the opportunity to go on a mountain hiking trip for seven days I immediately jumped on it. A few weeks after the day arrived and I went on the adventure. There is a big difference between hiking alone in a safe trail in France and being responsible for guests on an unknown wild trail in Canada. I really had to take responsibility and be confident about what I was doing. The first day was an 8 hour hike in the Canadian landscape. Not a little challenge ! Thankfully, the beauty of the wilderness and the support of the team gave me the power to lead my guest and me to the camp. I like to be out of my comfort zone and in challenging situations and that was exactly what I was living. Working with horses at 5am and being ready for my hiking day as a guide was a completely new adventure, that’s for sure ! I knew that I had to catch the rhythm really quick. I had to give myself enough rest to gain enough energy for all that I had to complete during my day. No time to be lazy! I discovered and understood a few important insights during this mountain hiking trip and I wanted to talk about three of them. The first is that your body is able to do everything as long as you train it. I realized that because after the two first difficult hiking trails, I felt strong and I achieved my hikes way more efficiently. It is all is about the constant training that you do. The second is that doing something enjoyable in your work or aside, keeps you balanced enough to find the power to continue. 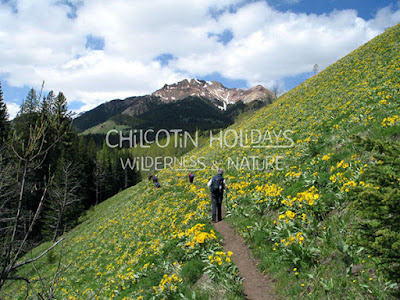 For myself, enjoying the 360 views of the Chilcotin Mountains kept me motivated to not give up during difficult hiking trails. The third is that hiking is not just about a physical exercise, it’s also a lot about mental exercise! It’s maybe the most important thing during the process. If you think that the ridge is to high or the downhill is to steep you’ll never be able to do it. You have to believe in yourself and keep going until you reach the top, that's actually the main point. Keep going, even if it’s hard, even if you can’t see the end, you have to make this effort and stay focused on what you are doing. Don’t look at the end of the difficult hiking trails and think « it’s really too far away for me», just focus on where you are now and on what you are doing to reach the top. Keep putting in the effort so you can go to where you want to go. For me it’s related to what I’m living and I think everybody can apply this concept to their own life. Because I have big personal goals, when I look at them sometimes I feel a bit scared or discouraged because it’s big and far away from me. But if I just focus on what i’m doing now to achieve these personal goals, step by step I can reach the top of my mountain. The trail to the top can be tough, with a lot of up and downhill, with roots ready to get you down or rocks ready to make you slip, but if you're are aware of your environment, if you invest in your body, get your mind ready and stay in the present, you will achieve your personal goals more than you would have ever expected. challenging situations, until I reach the top of my mountain.